This page is for the original game. For the Source engine port, see Half-Life: Source. For the unofficial remake, see Black Mesa. Disc only needed to play CD music, and in previous versions; authenticate. All non-Steam releases can be redeemed on Steam. Soundtrack is available for free here. Steam Edition has been updated to have full OpenGL support with texture filtering and smooth dynamic lighting. The official public demo that includes an exclusive chapter (and a training level) with content not found in the full release. It can be downloaded here. The demo uses an older version of GoldSrc and may have compatibility issues with modern systems. For full compatibility, the SteamLink mod reworks the demo as a Half-Life mod. A pre-release demo exclusive to OEMs. It contains the chapters from the full release up to and including "We've Got Hostiles" (5 chapters and a training level). It can be downloaded here. Note that the demo uses an older version of GoldSrc and may have compatibility issues with modern systems. 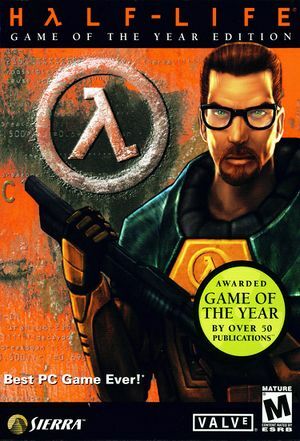 Half-Life: Game of the Year Edition comes with both the base game and Team Fortress Classic. Half-Life: Dreamcast is an unreleased port of Half-Life to the Sega Dreamcast. It includes various differences from the PC release (ex. modified levels, new models, adjusted difficulty, etc.). A mod that ports the Dreamcast version as a Half-Life mod is available on Mod DB. Steam release already skips intro videos. *.cfg files store the configuration. Game is Vert-; see Field of view (FOV) for a workaround. Use Half-Life WON Resolution FOV MP3 Patch for non-Steam versions. Vert-. Increase FOV to compensate. See Field of view (FOV). Both in-game and menu UI become too small. 90 by default. See Field of view (FOV). 16 samples by default in Steam version. Use gl_ansio X[sic] in the console, with X as number of samples. See OpenGL texture filtering to disable texture filtering altogether. 4x MSAA by default in Steam version. Use -nomsaa to force off. Capped at 100 FPS. See High frame rate. See OpenGL overbright lighting to increase the rendering dynamic range. 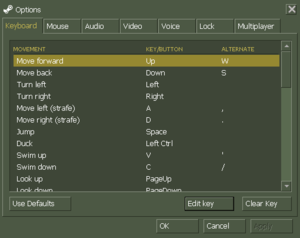 For a list of console commands, see here. FOV adjustment may be necessary at widescreen resolutions. In the game's launch options, add +default_fov ###, replacing ### with the desired FOV. While in game, open the console (~). Type default_fov and press ↵ Enter to confirm the changes have taken place in-game. Weapon models are affected by changes in FOV. 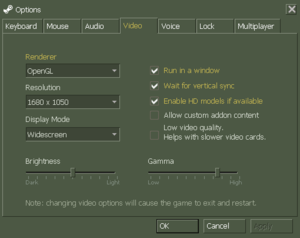 To maintain identical vertical FOV to the 4:3 FOV at 16:9 resolutions, use 106. At 21:9 resolutions, use 121. Disabling the cap affects physics of objects and NPCs. By default the filtering is enabled (not in Software rendering mode). Create a file called autoexec.cfg. Add new line gl_texturemode gl_nearest. Using the line gl_texturemode gl_nearest_mipmap_linear instead will enable mipmapping to prevent some textures from flickering at a distance. Overbright lighting increases the rendering dynamic range, resulting in a primitive "bloom" effect. Overbright lighting normally only works on the Direct3D and software renderers. On the Half-Life profile, set Extension limit to On. Apply changes. Add new line gl_overbright "1". Doing this will disable multi-texturing, which has the side-effect of disabling detail textures, which may effect the appearance of user levels and mods. Intended for single sticks like a flight stick; controllers like an Xbox 360 Controller will only use the left stick. A3D 2.0 and EAX were supported. Both have been removed during the transition to SteamPipe. 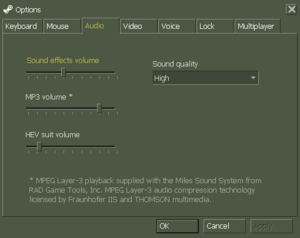 See MetaAudio for Steam version. Censored (enemy soldiers replaced with robots, gore removed). Uncut on the Steam version after April 29, 2017. Steam Edition actively supported via Steamworks with a small but dedicated community. Use Sven Co-op for co-op (see the FAQ). Servers are hosted using a separate "hlds.exe," which can be downloaded with SteamCMD. Only LAN, by default. Use sv_lan 0 in the main menu and, if you have port forwarding set up, others can connect with the connect "ip address" command. Install Half-Life VR Mod into game root. Add -game vr -dev -env -insecure -nomouse -nojoy +sv_lan 1 +sv_maxspeed 125 to launch options. Set opengl32.dll to Read-Only in the installation folder. There is an issue with the current Steam release of Half-Life, put short you can end up downloading the censored version regardless of your location. On certain graphics cards, using the D3D renderer can result in severe input lag, even with disabled VSync. The retail version defaults to 16-bit color depth. In Windows 7 or Vista, some users may experience extremely low frame rates during gameplay, even if their PC can run modern games perfectly. Press Ctrl+⇧ Shift+Esc in order to open the Task Manager. Under the Processes tab, find HL.exe and right click it. Set its priority to high. Make Half-Life is not currently running. Download the replacement liblist.gam file from here (Download starts immediately). Extract into the valve folder in the installation folder, replacing the existing file when prompted. 7 Lost with Linux update. 2.1 3DFX MiniGL included in retail version. WON, Steamworks WON for retail, Steamworks for Steam. WON has been shut down on July 31, 2004; fans have since recreated the network as WON2. Xash3D is a custom GoldSrc build made to overcome the limit of the GoldSrc engine and fix compatibility issues on modern systems. 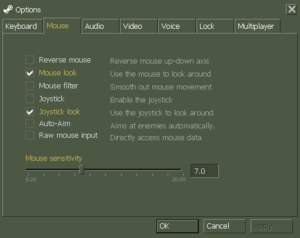 It also brings back features that were removed from the recent update for Half Life through alternative means such as using OpenAL Soft for the 3D sound and include options fit for modern systems, including HUD scaling. Some modifications for the original game may not work unless required files are converted to support it. Alternative audio pipeline for GoldSrc. Re-implements 3D audio without replacing entire rendering pipeline. Combines A3D’s HRTF and Occlusion with EAX’s reverb. Not compatible with software renderer. Must use -insecure. Do not use on VAC secured server. The High Definition Pack replaces most weapon and player/enemy models with higher polygon versions. For other options follow this guide. The option to enable the pack in-game is in the options menu, and the game must be restarted for it to take effect. The effect changes the art style dramatically, and whether or not it's desirable is up to personal preference. 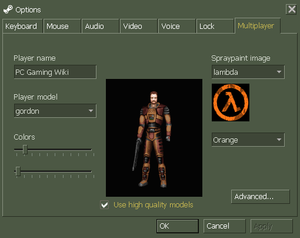 Half-Life's main menu was changed with the game's transition from the WON (World Opponent Network) system to Steam. This mod restores the look of the original menus and adds the PlayStation 2 version of the menu music. An alternate GameBanana download link can be found here. Menus are 4:3 by default and cannot be stretched to fullscreen. In-game is untouched. See Half-Life Crosshair Changer to customize the crosshairs. Enabling developer mode will allow use of in-game cheats and various console commands. The developer console can be opened by pressing ~. You may have to turn it on in the in-game settings first. You can use the console command sv_cheats 1 to allow the usage of console commands such as god and noclip. You might have to reload a save-game after enabling cheat-mode for certain commands to work. ↑ 2.0 2.1 How to get 144hz/fps? ↑ 6.0 6.1 Steam HL1 5.1 sound - Steam discussions forums.